If you are an owner of a rental property here in Ashland, Oregon then you won’t want to miss this special report. 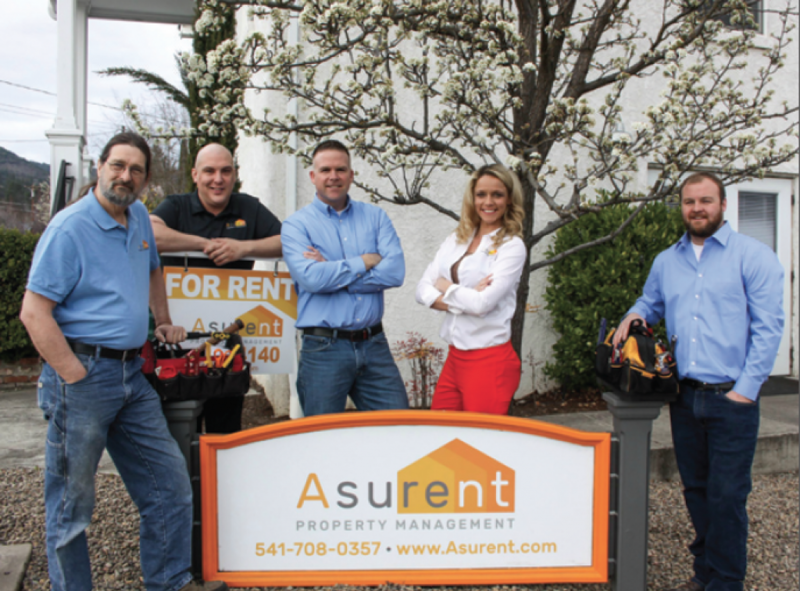 Locally owned Asurent® Property Management is earning more profits for their property owners while keeping residents happy and secure in their rentals. What makes this company so successful? It is the continuous and unyielding dedication to customer service. Customer service is not just for the homeowner but also for the resident. Homeowners want to know their investments are protected while residents want to be respected and valued. Asurent® Property Management seeks to build win-win-win relationships that allow them to offer the highest level of service to all of their customers. In today’s interview I speak with local owners Lisa Petrini and Patrick Rogers to learn more about their model and methods of success! Welcome Lisa and Patrick, and thanks for taking the time to speak with us today. To begin with I am really intrigued and inspired by your business model of win-win-win. Why does this make sense to gaining higher profits with happier tenants? Thanks Shields, first of all, the win-win-win concept makes sense on so many levels. The first is that so many other property management companies dedicate any and all customer service to the property owners only and leave the tenants (whom we prefer to call residents), with horrible customer service and feeling very neglected. We believe this model is 180 degrees backwards from what it should be. At Asurent, we believe that if we dedicate premier customer service to our residents, our residents will take premier care of the rental, be excellent neighbors and pay their rent on time every time. This alone results in an excellent product for the owner. The owner is now receiving rent every month and their home is being taken care of by a very happy resident. A happy resident is a paying resident. Contrast this with a tenant which never hears back from their property management company, requests maintenance to be performed and is completely ignored. You can see how the win-win-win model makes the best sense for everyone. When you combine a highly trained staff and efficient workflows and systems, it allows Asurent to focus on excellent customer service with our pre-selected owners and residents, rather than always having to deal with damage control and the unnecessary drama which typically burns up the time of other property management companies. Patrick, will you please introduce us to your company and history here in the Rogue Valley? 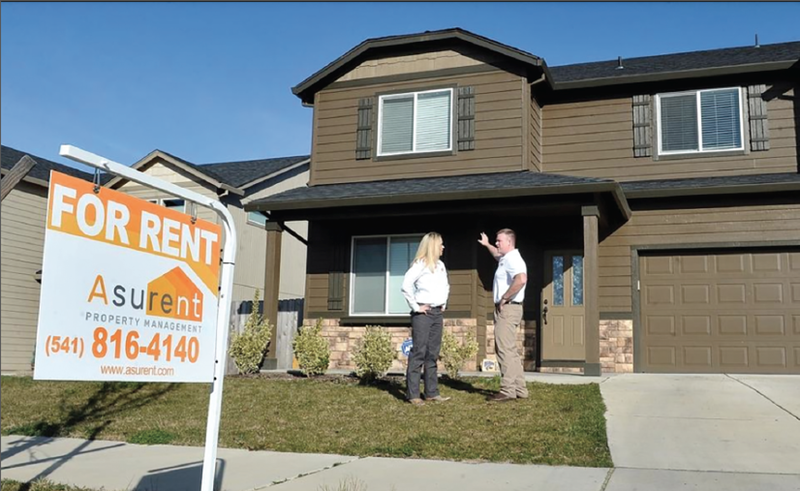 Asurent has been managing rentals in the Rogue Valley for over 3 years now and we manage over 250 units. I’ve been licensed and managing rentals in the valley since 2010. Concurrently, Lisa and I have been coaching and consulting property managers throughout the United States since 2010 as well under the name Rents2Riches. During that timeframe, we helped hundreds of property management companies to be very successful utilizing our methodologies that we utilize in our own business. Since we were exposed to so many property management companies, we were able to identify the most common mistakes property managers make, and how to overcome them. This has allowed us to develop a robust and efficient operations system that completely ties in the win-win-win model. Lisa, what advantage do you see Asurent bringing versus what you see being offered in the market? Great question Shields. Other companies are complacent and owners often find themselves having to “Manage the Manager”. We lead the process with an active property management approach. We manage our rentals and make decisions for the property as if we owned it ourselves. And that is so lacking in this industry. Just truly caring about the rental like it is your own forces our team to make the right decision every time. For example, we took over a completely rent-ready property in Ashland that had been vacant for over 4 months. We implemented our marketing system and had 3 applications and filled the property within 1 week at a higher price than was previously marketed with the other company. Most property managers have been handling properties the same way for years. While a number of them have implemented industry specific software, operations have changed little. We have implemented a culture of continuous improvement and change that allows our employees to actively participate in improved employee productivity, automations and advanced workflows that results in 50% of our efforts tied directly to enhancing the return on investment for our owners. We are typically able to achieve 10-40% increased revenue for our owners compared to other property management companies, all while creating an enhanced living experience for our residents. Another advantage to Asurent is that it all begins with Resident Selection. While with our continuously improving sophisticated processes, we can achieve premium resident selection about 50% faster than traditional passive style property management companies. Usually this means that we can review about double the number of applicants to yield the higher preferred new resident. We take the standard processes and vigorously enhance it with proprietary techniques in a highly efficient manner. This also allows our standards to be higher than others and at the same time produce a higher quality resident for our properties. Let’s talk more about keeping the balance between tenants and property owners. A happy resident is a paying resident. In order to maintain a well-rounded relationship between all three parties- owner, Asurent and the tenant- it is important for everyone to understand each of our roles and responsibilities. When Asurent takes on an owner we are very specific on how we want the property presented during a vacancy and how quickly we respond to maintenance requests from the tenants. Throughout management we continuously recommend improvements for the owner to do to the property keeping the home updated. During tenancy our tenants know it is their responsibility to report any maintenance issues protecting the home and/or preventing further damage. If they neglect to report damage they could be at fault ultimately costing them in the long run. Our tenants know we have a three-day maintenance guarantee to address each maintenance issue. The tenants’ role is to maintain and protect the home during residency. The owners’ role is to provide a clean and habitable place for a tenant to reside. And Asurents’ job is to ensure both parties are taken care of equally, creating more rental income and less rental stress for the owner and a safe, clean and desirable place of residence for the tenants. What are the biggest mistakes that you see customers make when choosing a property management company? 1. How often do you perform internal inspections and do you document them with detailed pictures and reports? Asurent answers – We perform a detailed 200+ picture internal inspection before a resident moves in, then again after 60 days to ensure they are following up with their end of the bargain, and then again annually before we approve a lease renewal. All detailed with complete photographs in a report. 2. Do you guarantee your maintenance response to residents’ requests within a certain timeframe? Asurent answers – We commit to a 3-business day response to non-emergency requests. 3. Do you have any other fees besides your monthly percentage? Beyond that, do you charge a fee if the property is vacant? Asurent answers – We charge a 1-time start up fee of $150/property. You do not get charged any other fee besides the monthly management fee. We do not charge you while the property is vacant. Let’s talk more the artful communication that is necessary to keep on top of things. Over-communication is key in this industry for owners and residents alike. Our residents trust that we have their best interests in mind. We maintain open and honest communication channels that ensures all small items are found and repaired while they are small and this ensures a happy resident. We don’t want our Residents ever feeling like they need to hide repairs from us for fear having rent increased. For example, we took over a property where the market rent was $1,550/month. The previous company was charging $1,000/month and had not performed an inspection in 7 years, since the resident moved in. On the same token, the resident outright told us he never heard from them and was afraid to call them for fear of getting an inspection and getting removed or having maintenance performed and causing more costs. This happens a lot! Either way, it is not a win-win situation for anyone. As a result, the resident had not asked for any repairs to be performed during that time and the property manager company had not stepped foot in the house once in the last 7 years…not once!! When we performed our transition inspection, we were sad to report that all of the carpets had to be replaced, the walls had to be painted because the resident smoked, the kitchen cabinets had to be sanded and repainted, subflooring beneath sinks replaced because small leaks had developed over the years and where never resolved. This cost this owner over $17,000 in repairs and had been costing them the additional $550 per month of loss of rental income that they should have had. All the while the resident was living in substandard conditions. No one wins. We also want our owners to feel completely assured that their property is being well taken care of. We don’t want owners wondering or thinking if things are OK if they do not hear from us. When a property is vacant, we reach out to our owners and update them on the status of filing that vacancy. We share with them the number of emails, phone calls, showings and applications we have. We also communicate any recommendations we might have with respect to whether or not we may need to lower rental amount or perform some repairs based on the feedback and response we are receiving. Our owners also receive the routine inspections and updates from us giving them the assurance their property is being well taken care of. Lisa, what are some ways that you go the extra mile to respect resident rights and privacy while guaranteeing the property is well taken care of? We respect our residents’ rights and privacy, 100%. When we perform our 60-day internal inspection on a new resident or our annual lease renewal inspection, we call the resident that week it is due and notify them the day and time we plan to perform the inspection. We let them know that they may be present, but do not need to be. This gives the resident the 24-hour notification requirement (and usually much more) required by Oregon Real Estate laws. Our residents very much appreciate our flexibility in performing our inspections and they also appreciate our willingness to ensure the property is kept in top shape for them. You talk about raising fees yearly. Why is this important for the sustainability of all parties involved? This is an area that most property managers completely fail at, but is so important. We do not advocate raising rents just to raise rents. The problem that most managers fail to realize is that the cost of owning a property goes up every year. Every year property taxes are increased, the cost of maintenance (labor and parts), goes up. Almost every year there is a new levy or city street tax that is implemented. Inflation also affects the amount of net profits every year. We advocate implementing a small and minor rental raise that only compensates for the increased costs of owning that rental. Typically, this is in the $25-$50 per month range, depending on the property. Our residents know ahead of time that they will be receiving an annual rental rate increase, depending on the economy and true property operations costs. This ensures top quality customer service for the residents and excellent property preservation and monthly revenue for our owners. Lisa, will you please talk more about the Asurent® Model of Premium Properties? Why does having and maintaining a nice property encourage and attract respectful residents? The Asurent mantra is that A Premium Property, combined with Premium Marketing and Premium Management will yield a Premium Resident who pays Premium Rents. This means that when a property is brought to a level that it can stand out from the competitive rentals, and than marketed through our system, it will attract the highest quality residents. First off, we work with our owners to transition ordinary properties to premium properties. We have a fully staffed maintenance team that excels in this. Next, when we market a property, we take enhanced quality photographs and also a premium video walkthrough. We have found that a professionally created video allows potential residents to “see and feel” the property many times without even stepping foot onsite. We then distribute this marketing to over 40 online rental websites to cast the widest net possible for your property. This results in the most possible potential applicants responding. This, combined with premium management, highly skilled employees, and enhanced technology, results in premium residents paying premium rents for a premium living experience. Having a responsive property management company is key. Asurent guarantees a 1-day response time and a 3-day repair timeline. Please say more. This reflects directly back to our core resident focus. As part of our Resident Happiness Program, we deliver a 1-day communications response to our residents (and owners alike). This industry is so riddled with “mom and pop” substandard service and lack of basic communications, that when you can do something as simple as responding very quickly to our residents concerns, it creates an atmosphere of excellent customer service and trust. Our residents know that we deliver on our promise and appreciate the difference they receive compared to other property management companies. Residents that feel like they are receiving excellent customer service will stay loyal to that property and company and we have found tend to stay in that property up to 50% longer, thus reducing owners’ vacancy times and revenue loss. As a part of that, we have a core commitment to our residents that when they submit a maintenance request through their online portal, we will commit to being onsite within 3 business days. This is game changing and no one else in the valley can come even close to that type of commitment. This is so important because it is again, excellent customer service, but it also ensures that the rental is properly taken care of and any and all valid maintenance issues are resolved quickly and efficiently, delivering the best possible property preservation. I really appreciated your article that you published last month about how to reduce vacancy time and therefore save money. What great tip! Can you share a few more with us? Absolutely. I will list two below. Also, for a complete 5 video series we prepared specifically for owners on how to maximize their rental income, you can go directly to www.5ProfitPullingSecrets.com and receive a new video every other day! The two most impactful tips for any landlord are to perform inspections on a regular basis. You never know what to expect if you don’t inspect. Additionally, when you perform a move in inspection before a new tenant moves in, make sure that you take pictures and document every square inch of the home within 3 days of them moving in. For example, we take over 25 pictures just for the kitchen alone. This is critical if a resident moves out and creates damage. You will need undeniable proof that they caused it in order to utilize their security deposit. The second tip is that you should respond to all resident inquiries quickly. You want your residents to know that you care about their habitability. You also want them to trust that when they call you with a legitimate request, that you will act on it quickly. If you lose this, you lose them caring about your property and your property (and your wallet) will suffer in the long run. Asurent® has been able to form great relationships with it’s customer here in Southern Oregon. Can you share some recent testimonials with us? As you continue to grow the company here in the Rogue Valley what types of clients are you looking for? We are looking for owners that can appreciate our Premium Management philosophy. We want homeowners and investors that want their investments protected and can appreciate that residents want to live in nice homes with respect and integrity. We have worked with what we will call “slumlord owners” and it just doesn’t work. These are owners that will fight us on every and all recommendations for maintenance and that is a lose-lose-lose situation. Residents end up being not happy, and after too long, try to get out of their lease. They also take poor care of the property, again costing the owner more money in the long run. These residents also end up not appreciating the service we are trying to provide because ultimately if the owner will not pay for a repair, then the resident suffers. We refuse to work with these types of owners as everyone suffers. Lisa, what are the steps you like to take once you decide to work with a new property owner? The first step when we are working with a new owner is to sit down and 100% understand what their goals are for their property portfolio. Then from that we perform a rental rate market analysis and determine where they are now compared to where they want to be. We then assemble a plan of action that often includes repairs and improvements that will bring the property to a rent ready state and at the same time enhance the potential rental rate amounts and reduce the amount of time it takes to procure a high quality resident. Sometimes, if current residents are involved, the plan may be to assess the current residents. If they are not what we would consider to be Premium Residents and not a good fit for our owners goals we may need to consider upgrading residents. Patrick, can you talk more about the transition checklist and goal setting that happens for a property? When we work with investors that have more than 5 properties, we implement a “transition checklist” that outlines the necessary actions that we take in properly transitioning the properties and executing the plan we assembled for this owner. We then meet with the owner, either in person or over webinar to review the checklist and discuss progress and any challenges that we may be facing. This allows the communication flow between the investor and us to be open and transparent. Delays are minimized and efficiency in execution of our deliverables is drastically increased. We have found the hard way that over communication is necessary, especially when dealing with an investor’s portfolio, to ensure they truly know the amount of work that is going into their property. What are the market trends you are paying attention to that help guide the company locally? We stay very close to the market trends and local ordinances that can affect our owner’s rental property portfolios. This includes: the state of the sales market, Oregon rental laws that can effect profits, and local building efforts and laws that can also affect this. Our owners receive an email from us when significant changes and/or potential changes could occur. For example, in 2017 when measure HB-2004 was in the Oregon Senate to implement rent control and eliminate no cause evictions, we rallied through our owners to get involved and voice their opinions, as it does affect them. If someone is currently working with another property management company is it easy to transition over? Yes. Transitioning to Asurent is extremely easy! We take care of everything for you; from notifying your current property management company (if there is one), to getting everything from them (current lease, inspections, keys, security deposit, etc), to notifying the tenants. We do everything. You do nothing! We take the stress 100% off the owner/investor’s plate and remove the hassle from your life. Do you ever refuse a property owner? The answer is simple – Yes. We refuse to work with owners and we fire owners. In fact, we are in the process of firing an owner right now. This owner has refused to perform simple maintenance that is required to rent out his home. It is a nicer home in a great community in Ashland. However he has delayed and delayed on repainting the interior of the home, which is very much needed, re-tiling a bathroom and other needed items. Because of this, prospective residents are seeing the home in this condition and it is reflective on our companies’ reputation. That is not how we operate. Asurent is demonstrating a unique model in which everyone wins and I would like to congratulate you on the creation of this great business here in the Rogue Valley! Are there any last thoughts or comments you would like to share with our readers? Thanks for taking the time to read. We hope the information has been useful. If anyone has any questions at all please give us a call. Finally, don’t be afraid to ask questions. Better to ask questions and keep the stream of communication going rather than to be surprised due to lack of being informed.